STEPHEN SPAZ SCHNEE: OPEN HERE is just about to be released. How are you feeling about the album and the reaction to it so far? DAVID BREWIS: Mostly, we’re a bit too busy to dwell on it. I wouldn’t expect to see much reaction until the week of release and in the meantime, we need to figure out how to play it! The first shows we have coming up are quite ambitious, with an expanded line-up and set design and what have you, so there’s a lot for us to be thinking about. We’re also just about to move studio and Peter’s busy finishing a collaborative album he’s been making with Sarah Hayes, who’s been playing flute with us. And we’ve also just finished mixing and mastering the next Slug album! But it’s better this way. Too much time to ponder on what you’ve already done isn’t a good recipe for staying creative. SPAZ: There’s always been a sense of adventure on your albums. OPEN HERE sounds as if you are crossing various time barriers and genres. What inspired this batch of songs? DAVID: It’s quite disparate. I’ve ended up writing a few quite political songs, but I’ve also written about how trying to find time to still be your own person while being a parent. There are a few songs about life turning upside down. And there’s one vignette about our live sound engineer, Archie, who died in 2016. We miss him a lot. With musical influences, it’s really difficult to know what’s found its way in there. I’ve been listening to a lot of James Brown and some psych-era Donovan. And we’re both still in the midst of a never-ending Prince obsession. SPAZ: When you begin an album project, do you have a definite idea on what you want the end-product to sound like? Or do you let the album grow and take shape organically? DAVID: In the past, we quite often have had some kind of direction in mind, but it’s often quite vague or conceptual. Or vaguely conceptual. With the first album, we really went out of our way to avoid or subvert clichés and to have instruments play against each other rather than support each other. Which is why that album still sounds pretty odd to me. TONES OF TOWN was aiming for a more-live, more-free sound and we didn’t realize the extent to which me and Pete were on the same (dark and gloomy) page lyrically until afterwards. MEASURE was supposed to be sprawling and all over the place. With PLUMB we wanted to stitch fragments together and not just do “proper songs”. COMMONTIME was, mostly, direct and poppy. With this one, I don’t think we did plan anything. We’ve actually talked more about what the next FM album will sound like than this one. But there are certain themes in the music and the lyrics which have kept the whole thing feeling coherent. SPAZ: Regarding the direction of the album, was there a moment during recording when everything began to come together? DAVID: There was a point quite late on where we cut two songs which weren’t quite right and then the whole album had a shape and made much more sense. SPAZ: The title track is a lovely blend of ‘60s Baroque Pop and a wee bit of ‘70s/’80s experimentalism. Other tracks reveal even more influences (Synthpop, Funk, Psyche, Post-Punk, Pop, etc.). 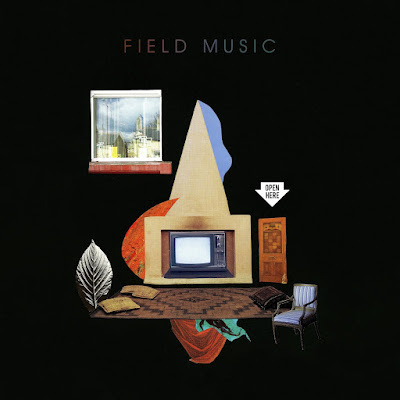 However, Field Music remains a completely unique musical force. Some call you Baroque Pop while others refer to you as Alternative Rock. How do you prefer to classify Field Music? DAVID: When people ask me what kind of music we make, I usually just say “weird Pop music”, and that covers all the bases. For me, there are only really two categories I’m bothered about; alphabetized by performer, or alphabetized by composer. That keeps everything nice and neat. SPAZ: Do you approach each album or recording project differently? With this being your sixth Field Music album, are you still discovering new ways to express yourselves? DAVID: We do have our starting points but we’re always working and we’re always thinking of new musical things to try. There’s not usually a big change but we’ll be trying to do something new with every song. And then all of the other projects we do feed into that a little bit. SPAZ: Is it difficult to pick singles or tracks to service to radio… or do you leave that up to the label? DAVID: We tend to defer to Matt and Ollie at Memphis Industries for choice of singles, though we might put up a fight if they wanted to go with something that we thought was unrepresentative of the album. It’s not usually much of a struggle. There aren’t exactly lots of potential singles on our records! 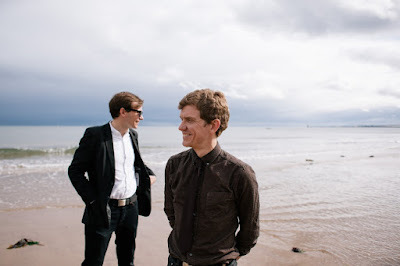 SPAZ: Like 10cc and XTC, Field Music’s albums remain both unpredictable and remarkably consistent. Do you still focus on the concept of the ‘album’ and labor over things like song sequencing? DAVID: For us, the album is the primary work. That’s what we do. So, we’ll never do a record which is three singles and a side of blues jams. The sequencing is important to us. Not so much for the sake of narrative (though both The Week That Was and the second School of Language albums were more fixed in this regard) but more for musical flow. 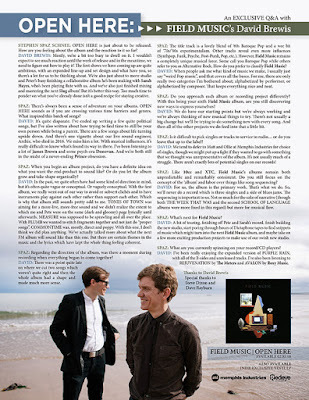 SPAZ: What’s next for Field Music? DAVID: A bit of touring, finishing off Pete and Sarah’s record, finish building the new studio, start poring through hours of Dictaphone tapes to find snippets of music which might turn into the next Field Music album, and maybe take on a few more exciting production projects to make use of our swish new studio. DAVID: I’ve been really enjoying the expanded version of PURPLE RAIN, with all of the B-sides and unreleased tracks. I’ve also been listening to REJUVENATION by The Meters and AVALON by Roxy Music.